COMMENTS: I use these all of the time for orders and they hold up well to weight! "Natural Frost handled bag 12x15"
COMMENTS: We use this for our cosmetic products and honey. They are strong and wonderful. I love these and just ordered our third batch. They are beyond belief and the clients love them because others can see what what they just bought at our booth at the farmer's market. 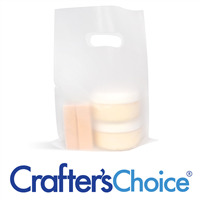 COMMENTS: I purchased these bags because they gave a nice professional look to my products, they were a good size for larger orders and you get a whole bunch for a little bit of cost. They are well worth the investment! "Great Size for my business!" COMMENTS: These fit my products in them well. They are thicker and well made, can't wait to get more! COMMENTS: I love this bag because my colorful products shine in them and when I am at fairs my beautiful soaps can be seen by everyone when the customer walks away with them in these bags. Very sturdy too! COMMENTS: Use these for my Craft shows. They are perfect size. Plus you can attacha label with your business info on them to customize them. "Perfect just as it is!" COMMENTS: This bag is so professional looking I use it just as it is and it's perfect. Large and sturdy and the frost shows my products through the bag which is a bonus for me. Will definitely buy again! COMMENTS: this bag is strong enough to hold whatever you want to put in it, and pretty enough to go anywhere. we love these for anything from lotions and soaps to large scented candles. I never worry about these breaking on a customer! COMMENTS: These bags are very strong and I couldn't tell from the picture but they have handles cut into them. Glad I gave them a try! COMMENTS: Very sturdy bags! Hold up to the weight of 3 16oz candles AND bath~body products! Love the handles! Perfect for shows and parties! Very classy, print a business label (gold or silver foil) on them! Makes you proud of your products inside! COMMENTS: I use these bags for both my gift shop and when I go to the farmer's market or craft fairs. It is very strong and versatile. It makes a finished product and my customers love them. I put a ribbon on the handles and my label on the bag. For gifts the frosted bag is great because you can see the colors of the tissue or shredded paper inside the bag adding to the professional look of this wonderful product. "Could you stamp a logo onto this bag, or is a sticker the way to go? " I tried stamping some and it seems to rub off easily, I would say that a sticker is the way to go.